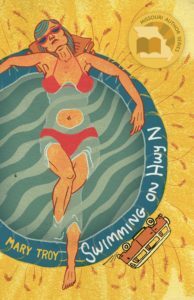 A friendly reminder: Mary Troy will be reading from her novel Swimming on Hwy N and discussing writing at Southern Illinois University Edwardsville tonight. The event will get underway at 5:00 p.m. in the Morris University Center Bookstore. Swimming on Hwy N was published as part of Moon City Press’ Missouri Author Series.